Shakespeare’s tragedy “Romeo and Juliette” was told in many movies, while Franco Franco Zeffirelli’s version remains monumental. However, Jerome Robbins and Robert Wise wisely revisit the story we love in a way, that no one ever can dispute that it has its own crown to wear. It takes you from the street of Verona to New York’s West Side, where a modern version of Montagues and Capulets takes a whole different shape, once again, to celebrate a love. A love that fails to live the widely known version of “happily ever after”. Sharks and Jets can’t stand each other. They do everything possible to ruin each other’s day. Tony is a former Jet who falls for Maria, a sister of the leader of Sharks, Bernard. One day, everyone will meet at night to decide the fate of each other, where the two will lose their lives. While the tension grows between their respective friends, the unforgettable atmosphere, outstanding choreography, dances and timeless music will make your heart sing along with its heroes. As a result, the ugly fight will turn into a beautiful piece of art. Maria, played by Natalie Wood, is a Puerto Rican who, the same as her father, lives with an American dream, but they’re opposite to each other. Seemingly quiet and uneventful evening brings her to the dance night where she meets Tony, a tall, handsome young man, who knew before entering the room that something big is about to happen to him. That big thing, love, is what blinds him and makes him forget about the rivalry he used to have with Bernard. However, his best friend Riff seems restless until he solves the dispute between Bernard and his company, and schedules “a peaceful fight” that turns into a bloodshed. Maria, when she finds out about the life-changing night, begs Tony to go and stop the fight. But the truth is, even Tony could have done nothing to stop it, not even with the knife, that will write its own story. 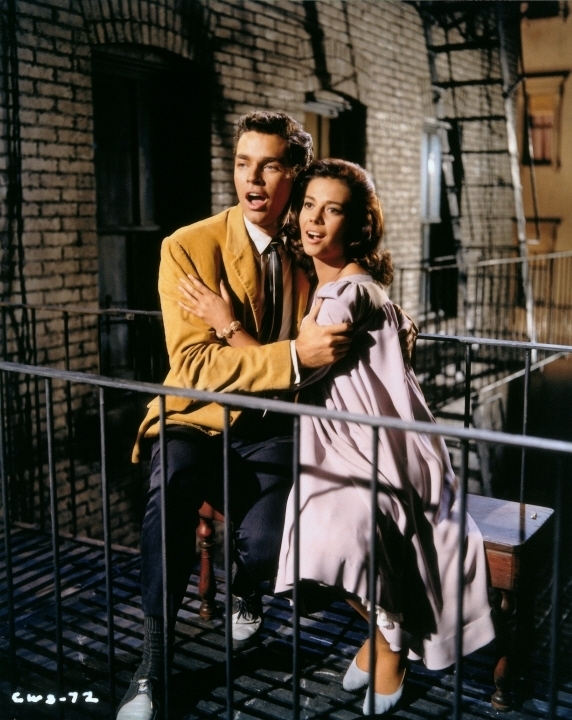 WEST SIDE STORY was made in an era of great musicals, where it proudly took over the pedestal. It is dynamic, has charisma, and a beautiful and well-known story told through memorable songs and performances, where Rita Moreno, Russ Tamblyn, George Chakiris and the incomparable Natalie Wood shine in every scene. With the cast WEST SIDE STORY had, directors Jerome Robbins and Robert Wise had no chance of failure. Everything about this film is a perfection that will live through generations as one of the all-time greatest musical film ever made.